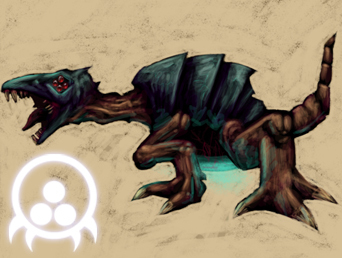 The highest stage within the Metroid life cycle. The Queen Metroid is the monarch of Metroid society. Using sub-sonic telepathic brainwaves she can control the thoughts of every single Metroid within her kingdom. 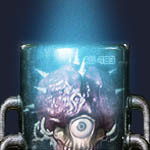 The Queen, although having a large mouth, does not have rows of teeth as seen in previous Metroid mutations. She has almost lost all teeth in her mouth, except that of which has grown in the front and sides of her massive maw. She has no reason to chew try to mame prey; her many drones do that for her. The Queen has a segmented neck of about 14 amorous plates that surround the leather hard tissue that lies beneath. The neck, when fully contracted to length, has a total reach of an estimated 50 ft. With the terrifying speed of 45 mph contraction speed, anything foolish enough to get within reach is usually down before they know what hit them. The Queen has also has built a natural plate of armor atop her head to use as a final ramming defense. The Queen has also developed an advanced system of launching hardened mucus-like projectiles towards any possible threat. By doing so, she can make her enemy become immobile for a long period of time. 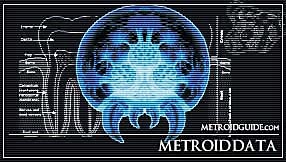 Not much more is known about the Queen metroid. Only one has ever been sited and even that was not by human eyes but by mechanical drones sent into the chamber. What limited detail they sent back is that entire scientist's have to go off of to make speculations about this truly monstrous beast. It is also unknown if the Queen Metroid is yet another advanced molting stage caused by some natural phenomenon or if there are infact Metriod Eggs specified for future Queen Metroid incubation. As this phenomenon has never been observed nor has any definate evidence been gathered upon the subject, xenologists can only speculate of the exact origins and conditions for this monstrous creature.